Here at Airedale Springs, we’re constantly discovering new ways in which to improve our spring design. It’s a tough process, but the feeling of finding such discoveries is un-matched by anything. So we can’t imagine the feeling of wonder that was obtained once the discovery of steel was made; something which has revolutionised the way we live forever. But while many will attribute said discovery to none other than Sheffield’s Harry Brearley, it turns out it may not be as clear as you think. Because of humankind’s instinctive drive to beat all competitors and claim to be the first person to do something, it means that everyone and their children have a claim to be the inventor of stainless steel; from across the pond in the US, to Scandinavian Sweden, and of course to our shores right here in Britain. So where did it all begin? 1820 to be precise! English scientists, Stoddard and Farraday noted that iron-chromium alloys were more resistant to attack from certain acids, but these tests were only carried out on low chromium content alloys as this was before the production of higher chromium alloys. We then fast forward to 1872 where Woods and Clark, another pair of Englishmen, filed for a patent of a weather and acid resistant iron alloy which contained a higher amount of chromium (35% to be exact). This was effectively the first patent of stainless steel. However, three years later a Frenchman named Brustlein pointed out the importance of low carbon content in the making of stainless steel. He noted that to create an alloy with a high percentage of chromium, the carbon content must be below around 0.15%. Then we jump to 1895, when a German named Goldschmidt developed the reduction process for producing carbon-free chromium advancing the development of stainless steel ten-fold. Then, in 1904, French scientist Leon Guillet undertook extensive research on many iron-chromium alloys but failed to note the potential corrosion resistance of his materials. This was instead discovered by two German scientists, Monnartz and Borchers, who in 1911, found that there was a significant boost in corrosion resistance when at least 10.5% chromium was present. It’s at this point that Harry Brearley, who in 1912 was tasked with finding a way to prolong the life of gun barrels which were eroding too quickly. Setting out to create a steel that was erosion resistant rather than a corrosion resistant one, it led to the creation of such a steel made with 12.8% chromium and 0.24 carbon which is seen by most to be the first ever stainless steel. Like any good history story, the ‘who did it?’ is just as complicated as the ‘how was it done?’ The most popular story is that Brearley etched his steels with nitric acid and examined them under a microscope to evaluate their potential against chemical attacks. He found his steel not only resisted these attacks but also ones made by agents such as lemon juice and vinegar. While that’s the most agreed upon tale, it’s certainly not the best. No, our favourite has to be Brearly throwing away his steel only to find the steel hadn’t rusted to the extent of its counterparts, similar to Alexander Fleming’s discovery of Penicillin 15 years later. 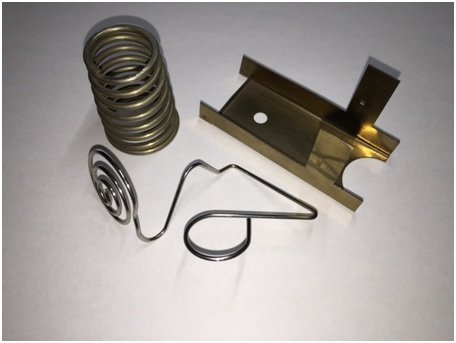 Stainless steel spring wires are normally supplied with a “soap” coating applied to the wire during the drawing process to reduce friction between the wire and the drawing dies. After heat treatment the colour of the wire can be light brown in colour. Contrary to some concern this is not “rust” just the natural colouration. This coating can be removed if desired by a passivation/picking process which chemically cleans the surface of the material. 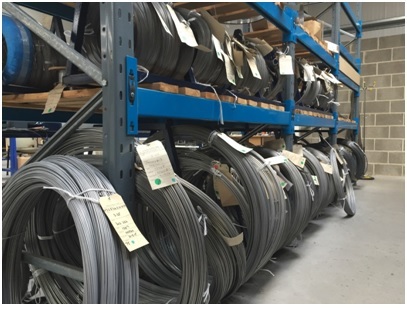 Stainless steel, as the name suggests is a stain less steel, not a rust proof steel and under certain conditions it will corrode particularly if it is contaminated with iron, used under extreme conditions and is unable to produce the natural chromium oxide protective coating. It is always helpful to know in what conditions components are required to function to ensure that the most appropriate grade and finish can be chosen.